Open Systems Theory course with Merrelyn Emery, April 5 to 10, 2019. Annual Meeting - Municipalities Newfoundland and Labrador - Gander - October 4 to October 6, 2018. Feile Tilting 18 - 95.1 stereo FM in Tilting, 104.7 Centre of the Island and 102.5 in Fogo - September 20 to 23. Iceberg Internet Radio - Sustainable Northern Coastal Communities Engagement Session - St. Anthony - December 5 and 6, 2017. Annual Meeting - Municipalities Newfoundland and Labrador - Corner Brook - November 1 to November 4, 2017. North West River Beach Festival - 92.5 Stereo FM in North West River - 95.1 in Happy Valley-Goose Bay - July 22 and 23, 2017. Municipal Symposium - Municipalities Newfoundland and Labrador - Gander - May 4 to May 6, 2017 - 104.7 FM. Network 17 virtual meeting - May 5, 2017: 5 p.m. to 8 p.m. NL time. Sharing Knowledge and Building Capacity for Regional Development Conference - 102.5 FM in St. Anthony - November 15 to 18, 2016. Feile Tilting 16 - 105.9 stereo FM in Tilting, 104.7 Centre of the Island and 102.5 in Fogo - September 22 to 25, 2016. North West River Beach Festival 31 - 92.5 stereo FM in North West River and 95.1 in Happy Valley-Goose Bay - July 23 to 24, 2016. Fogo Island Development Collaboration Radio (June 1 to 5) 105.9 stereo FM Fogo Island Central; 104.7 in Tilting; 98.7 in Fogo; 102.5 in Seldom, and 95.1 in Stag Harbour - June 1 to 5, 2016. Network 16 - Cape St. Mary's Ecological Reserve (May 27 to 29, 2016) - live on internet radio. Cape Shore Working Together Radio (May 26 to 29, 2016) - 104.7 stereo FM in Branch; 98.7 at Cape St. Mary's; 95.1 in St. Bride's, and 92.5 in Placentia. Network 15 - October 22 to 24 at 7 pm NL time - live on internet radio. St. Anthony (October 22 to 24) Iceberg Community Radio 102.5 FM from the Grenfell Interpretation Centre. Tilting and Fogo (September 16 to 20) Feile Tilting 15 - 104.7 FM from St. Patricks Hall and 95.1 at the Marconi Interpretation Centre. Corner Brook (September 9 to 10) The Future of Nature Conference -100.1 FM - broadcast from Grenfell Campus. Miawpukek First Nation (July 29 - August 2) broadcast and webcast their 20th Powwow - from the Conne River band office and the powwow grounds. 30th North West River Beach Festival (July 25, 26) celebrated its 30th anniversary - FM/Internet Radio from Striver with a repeater station in Happy Valley/Goose Bay. Bay St. George Live: Making Connections through the Airwaves project (June 11-13) featured programming from the Bay St. George mi'Kmaq Cultural Circle in St. Georges, the Centre de Les Terre-Neuviens Fran�ais in Cape St. George, and the L. S. Eddy complex in Stephenville. Placentia and the Cape Shore (May 5 to 8, 2015) The Placentia Area - Cape Shore Coomunity Connections presented Making Waves for national Mental Health Week. 92.5 Stereo FM in Placentia; 104.7 in Branch; 95.1 in St. Bride's and globally on Internet Radio..
Newfoundland and Labrador (October 22 to 25, 2014) The fourth annual meeting of NL community media volunteers - Network 14. Conche (October 22 to 25, 2014) The outport of Conche hosts Network 14. Conche Internet Radio had 269 households listening while the kitchen party had a virtual audience of more than 80 guests. Tilting (September 18 to 21, 2014) The 6th annual Feile Tilting festival. 105.9 FM in Tilting and 104.7 in the centre of the island. Tilting is now the NL community hosting the most community radio special events. Halifax (September 8 to 14, 2014) 106.9 GotAVoice FM: official radio station of the Gottingen 250 Street Festival. North West River (July 26 to 27, 2014) The 29th annual North West River Beach Festival. 92.5 FM in North set River and 95.1 in Happy Valley/Goose Bay. Guelph (May 22 to 23, 2014) Ryakuga Presentation to the University of Guelph Communication for Social and Environmental Change Glocal Seminar. Ferryland (May 12 to 16, 2014) Southern Shore Sounds 2014 from Baltimore School. This year's frequencies were 96.3 FM in Ferryland; 92.5 FM in Fermeuse, and 100.1 FM in Cape Broyle. Happy Valley/Goose Bay; Grand Falls/Windsor; Corner Brook, and St. John's (February 7, 2014) The NL Voluntary and Non-Profit Secretariat (Office of Public Engagement) hosted a 2014 Multi-site Community Summit Engagement. Tilting (September 19 to 23, 2013) Feile Tilting 13 was combined with Newfoundland Labrador Irish Connections for a celebration of Irish/Newfoundland Culture. Broadcast on 105.9 in Tilting and 102.5 in Fogo Central. Baie Verte Peninsula (August 22 - 25, 2013) The Gathering, 92.5 in Burlington/Smith's Harbour and FM 100.1 in Middle Arm. North West River (July 27 - 28, 2013) North West River Beach Festival, 92.5 FM in North West River and 100.1 FM in Happy Valley/Goose Bay. Corner Brook (June 10 - 15, 2013) All the Voices from CU EXPO/Network 13 June 10 to 15. Ferryland (April 29 - May 3, 2013) Southern Shore Sounds from Baltimore School. Halifax (November 22 - 24, 2012) Co-operating To Build a Better Nova Scotia, Mount St. Vincent University, Halifax. Norris Point (October 2, 2012) CURRA Symposium Session on Community Radio moderated by Ivan Emke. Webcast by Ryakuga; broadcast/webcast by VOBB. Tilting (September 19 to 23, 2012) Tilting, a National Historic Site of Canada and Newfoundland's first provincial registered Heritage District, celebrated Feile Tilting 12. Fogo Island (August 5 - August 12, 2012) The communities of Fogo Island celebrated their Island Vision with a week of community radio. The celebration included festivals in Joe Batt's Arm and Brimstone Head. North West River, Labrador (July 28 - July 29, 2012) The North West River Beach Festival celebrated its 27th anniversary with an FM Radio broadcast and simultaneous webcast. Cape Shore and Placentia (May 7 - May 10, 2012) Branch Town Councillor Mallary McGrath coordinated a four community event which featured big participation by Cape Shore youth. Bell Island (March 19 - March 24, 2012) Radio Bell Island was on air and on line to support Network 12. The community raised enough money to buy the equipment for a radio station. They expect to have their own community radio station this year. Flat Bay (January 19 - January 20, 2012) The Flat Bay Band Council hosted a community radio special event in Bay St. George. Cuslett (November 20 - November 25, 2011) Tramore Productions hosted a community radio special event to enhance their TIOW project: Creating Opportunities in Cultural Arts/Community Enhancement & Community Radio Communications. White Bay (November 14 - November 17, 2011) The communities of Jackson's Arm, Pollards Point and Hampden collaborated in a regional community radio project. Bonne Bay (October 20 - October 23, 2011) Participants at the Network 11 Unconference created a provincial network of community communications practitioners. Network 11 was a participatory communications networking event hosted by the Bonne Bay Cottage Hospital (Julia Ann Walsh Heritage Center), the Voice of Bonne Bay (VOBB), and the Bonne Bay Marine Station. The event was supported by the provincial Rural Secretariat, Memorial University Grenfell Campus and the Red Ochre zone board. Tilting (September 9 - September 11, 2011) Feile Tilting 2011 was on air September 7 - 11 from St. Patrick's Hall in Tilting. Ryakuga partnered with the Town of Tilting; Tilting Recreation and Cultural Society; Irish Business Partnership; Government of Newfoundland and Labrador, and the Fogo Island Co-op to bring you the broadcast and webcast of Feile Tilting 2011. This year we also placed a repeater transmitter in the school for better island coverage. St. Anthony (June 9 - June 14, 2011) Iceberg Radio 102.5 Stereo FM was on air 9 to 9, June 9 to 14, from the Grenfell Interpretive Centre in St. Anthony. Partners in the event included The Community University Research for Rural Recovery Alliance (CURRA), Grenfell Historic Properties and the Town of St. Anthony. Fredericton (May 31 - June 2, 2011) Social Economy Radio 97.9 was on air and on the world wide web from the Charlotte Street Arts Centre in Fredericton. The broadcast was in collaboration with CHSR FM the Fredericton community-based campus radio. We webcast simultaneously through MP3 and MP4 streaming servers. Cape Shore (May 17 - 19, 2011) The Cape Shore Community Radio committee used stereo FM radio to broadcast the Fatima Academy Spring Celebration. This year the broadcast was heard as 95.1 FM in St. Bride's, 98.7 in Point Lance and 104.7 in Branch. The event was also webcast as QuickTime MP4. Partners in the event are Fatima Academy; Tramore Productions; the Rural Secretariat; Avalon Gateway Regional Economic Development Board; College of the North Atlantic; Town of Branch; Town of St. Bride's; the Branch Cultural Historical Association, and the Cuslett Recreation Committee. Conche (May 9 - 10, 2011) Conche Radio 103 FM was a collaboration of the The French Shore Historical Association and Memorial University - Grenfell Campus. Burnt Islands (May 4, 2011) The Skills Link Media Interns produced Coastal Community Radio's second Radiothon. They raised $1,528 for a new transmitter. The radio station has been on air for five years. Bell Island (March 14 - 20, 2011) The Town of Wabana and St. Michael's school hosted a week long simulcast. The event was supported by the Rural Secretariat. Norris Point (November 10, 2010) The Voice of Bonne Bay and Ryakuga webcast a meeting of the Rural Catalyst from the Bonne Bay Marine Station. Mobilizing Research in Rural NL: Next Steps was organized by Ivan Emke and hosted by CURRA community coordinator Anita Best. Camrose (October 22, 2010) Ivan Emke presented on NL community radio (Turn Your Radio On: Engaging Rural Citizens Using Community Radio) to the Alberta Centre for Sustainable Rural Communities Taking the Next Steps (Sustainability Planning, Policy and Participation) Conference. We regret we were unable to participate. Tilting (September 9 - 12, 2010) Ryakuga partnered with the Town of Tilting, the Ireland Business Partnership; the Government of Newfoundland and Labrador, and the Fogo Island Co-op to bring you the broadcast of Feile Tilting 2010. Featured this year was simultaneous broadcasting with Community Radio Youghal in County Cork, Ireland. Norris Point (July 22-25, 2010) The Voice of Bonne Bay (VOBB) and Ryakuga collaborated to broadcast/webcast Norris Point Come Home Year. Ryakuga donated its 102.5 FM station to the community for the event. Norris Point (May 14 - 23, 2010) The Voice of Bonne Bay (VOBB) and Ryakuga collaborated for the third consecutive year to broadcast the Trails, Tales and Tunes community music festival. We broadcast at 102.5 stereo FM from the old cottage hospital in Norris Point. The event was also Shoutcast. Bay St. George (March 22 - 27, 2010) It was the first special event to feature a week of theme days - each with its own coordinating group. The Sonic Potluck Celebration was a partnership of the Rural Secretariat, the Long Range RED Board, Communities In Schools, the Office of Immigration and Multiculturalism and the College of the North Atlantic. St. Bride's (March 2 - March 6, 2010) The special event simulcast was Tramore community theatre's tenth anniversary celebrating the oral history, tradition and cultural diversity of the Cape Shore. Partners in the event were Tramore Productions; the Rural Secretariat; Avalon Gateway Regional Economic Development Board;Fatima Academy; College of the North Atlantic; Town of Branch; the Cuslett Recreation Committee and Ryakuga. Norris Point (October 27 - 31, 2009) The Voice of Bonne Bay community radio group, sponsored by the Community - University Research for Recovery Alliance broadcast town hall meetings on rural issues. The broadcast-webcast was supported by Ryakuga, the College of the North Atlantic and the Victoria Freenet. Tilting (September 18 - 20, 2009) Ryakuga and the College of the North Atlantic partnered with the Irish Newfoundland Partnership, the Ireland Business Partnerships; the St. Patrick's Club, the Tilting Recreation and Cultural Society to bring you the broadcast of Feile Tilting 2009. Norris Point (May 14 - 25, 2009) The Voice of Bonne Bay community radio committee, Trails, Tales and Tunes Festival committee, the Bonne Bay Heritage Corporation and Ryakuga produced the second TTT radio broadcast from the cottage hospital. The event was also webcast thanks to the Victoria FreeNet. Corner Brook (February 20 - March 1, 2009) Ryakuga loaned its portable radio studio to the ECMAs. Journalism students from the College of the North Atlantic worked on the broadcast. It was also a kickoff event for the Bay of Islands Community radio group. Cow Head (September 17-20, 2008) Ivan Emke facilitated the second Community - University Research for Recovery Alliance simulcast featuring Theatre NL's Cow Head Theatre Festival. Supporting the event were Vernon Payne from Ryakuga and Ryan Hermens. Twillingate (July 21-26, 2008) The New Rural Economy Project 2 sponsored a simulcast - FM 104.7 community radio special event and webcast for the Fish, Food and Fun Festival. Ivan Emke facilitated the project with support from Ryan Hermens and Ryakuga. Burnt Islands (June 10-13, 2008) - Ivan Emke and Krista Lee Keeping facilitated the first Community - University Research for Recovery Alliance simulcast and the first anniversary of CHBI. Ryakuga and the Victoria FreeNet supported the webcast. Norris Point (May 16 - 25, 2008) Ryakuga and the Community - University Research for Recovery Alliance is partnered with the Trails, Tales and Tunes Festival, the Bonne Bay Cottage Hospital Heritage Corporation; and the the Julia Ann Walsh Heritage Centre, the Town Council of Norris Point to bring you the Voice of Bonne Bay. Burnt Islands (November 29, 2007) - CHBI Coastal Community Radio hosted its first Radio Thon. Click here to hear Holly Keeping's on-air announcement. Vermilion, Alberta (October 10 - 14, 2007) - Ryakuga and Ivan Emke took the portable Ryakuga radio station to the annual conference of the Canadian Rural Revitalization Foundation. Click here to listen to traditional Ukrainian music by Willie, Fritz and Mike. Burnt Islands (May 15, 2007) - Ryakuga joined the celebration of Burnt Islands' new community radio station - CHBI - 95.7FM. Listen to Ivan Emke's Coastal Radio song. Wolfville (March 21 to 25, 2007) - Ryakuga, including Chris Cann with Ivan Emke and Charlene Croft facilitated a three day Equity and Technology Project community radio project. Ryakuga sponsored an additional two days to ensure there would be adequate time for community input. Musquodoboit Harbour (November 27 to 29, 2006) - Ivan Emke, Charlene Croft and Ryakuga worked with Eastern Shore students and the Equity and Technology Project to facilitate three days of community radio. Ivan, Jennifer Butler, Charlene and Ryakuga were also at the high school for a workshop on October 24. Twillingate (October 11 - 15, 2005) - Ivan Emke and Jennifer Butler took FM Radio 104.7 to Big Lessons from Small Places: A Forum on Governance in Rural North America and the North Atlantic Rim. Photos by NRE2. Burnt Islands (July 19/22, 2005) - It was the week of Burnt Islands Come Home celebrations and Sharing Our Future Youth 2005 were on-air for a 104.7 FM radio special event. Charlottetown (March 16, 2005) - Beyond Our Culture : an FM simulcast in cooperation with NetCorps International, Canada World Youth, the Baltic International Development Agency and the Victoria FreeNet. Tweed (October 13 -15, 2004) The New Rural Economy Project sponsored a simulcast - FM 104.7 community radio special event and webcast for the Canadian Rural revitalization Foundation. Stephenville (September 27, 2004) The Rural Secretariat and the Canadian Manufacturers and Exporters Newfoundland and Labrador Division sponsored a simulcast - FM 104.7 community radio special event and webcast. Burnt Islands (July 14 - 16, 2004) The Town of Burnt Islands celebrated the opening of its Hook and Line Interpretation Centre with a simulcast - FM 104.7 community radio special event and webcast. St. John's (October 28 - 30, 2003) - The final Tuning in to Climate Change media event was webcast as 20 kbps dialup audio and broadcast on 101.1 FM from the Visitors' Centre in Signal Hill National Park. Terra Nova National Park (August 5 - 7, 2003) - The third Tuning in to Climate Change media event was webcast as 12 kbps dialup audio and broadcast on 104.7 FM from the Marine Interpretation Centre in Terra Nova National Park. Corner Brook (May 27 - 29, 2003) - The second Tuning in to Climate Change media event was webcast as MP4 audio and broadcast on 102.5 FM from the Forest centre at Sir Wilfred Grenfell College. Kippens (April 29 - May 1, 2003) - The first Tuning in to Climate Change media event was webcast as MP4 audio and broadcast on 104.7 FM from the Kippens Community Centre. Piccadilly (March 30, 2003) - The ninth Enlarging the Circle media event, the annual meeting of the Port au Port Economic development Association, was webcast as QuickTime audio and broadcast on 104.7 FM. St. David's (March 29, 2003) - The eighth Enlarging the Circle media event was webcast as QuickTime audio and broadcast on 104.7 FM. St. George's (March 27, 2003) - The seventh Enlarging the Circle media event, the 25th anniversary celebration of the St. George's, Flat Bay - St. Teresa's Youth Organization, was webcast as QuickTime audio and broadcast on 104.7 FM. Robinsons (March 8, 2003) - The fifth Enlarging the Circle media event was webcast as QuickTime audio and broadcast on 104.7 FM. Stephenville Crossing (March 7, 2003) - St. Michaels School produced a full day of programming and Ryakuga broadcast the special event on 104.7 FM. Stephenville Crossing (March 6, 2003) - The fourth Enlarging the Circle media event, facilitated by the central youth initiatives committee and the Stephenville Crossing youth, was webcast as QuickTime audio and broadcast on 104.7 FM. Corner Brook (Feb 28, 2003) - Ryakuga webcast The Whiskey Mystics from the Blow Me Down Ski Park. But you had to be there to dance. McKay's (Feb 21/22, 2003) - The third Enlarging the Circle media event, the Bay St. George South Winter Carnival, was webcast as QuickTime audio and broadcast on 104.7 FM. Burnt Islands (Feb 8 - 9, 2003) - The Burnt Islands Sharing Our Future Community Media Youth broadcast on 104.7 FM. And webcast on Feb 9. Stephenville (Feb 6, 2003) - The second Enlarging the Circle media event, the Community Youth Network Southwest Newfoundland general meeting, was webcast as MP4 video and audio and broadcast on 104.7 FM. Cap St-Georges (Feb 1, 2003) - The first Enlarging the Circle media event, the Winterfest Pageant, was webcast and broadcast on 104.7 FM. 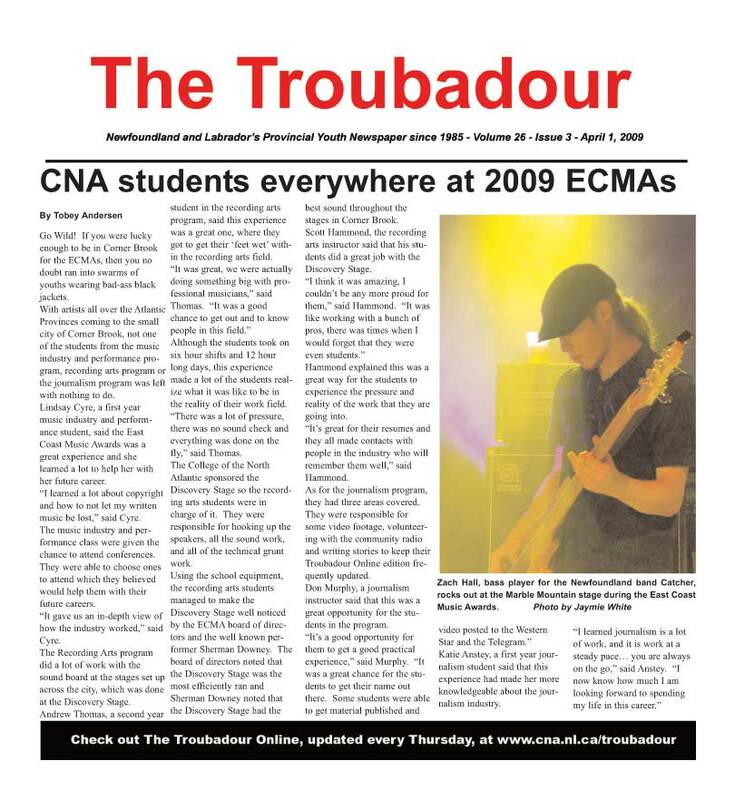 St. John's, Newfoundland (Nov 30, 2002) - The Canada World Youth Netcorps present the RuCa Radio webcast. Stephenville (Nov 2/3, 2002) - The Long Range Regional Economic Development Board Program, featuring local music, community participation and youth power, was webcast as MP4 video and broadcast on 104.7 FM. St-Jean Terre Neuve (25/26 Octobre, 2002) La communaute francophone de St-Jean Terre-Neuve celebre ses 20 ans et pour feter l'occasion nous allons tenir la premiere emission radiophonique en francais. St. John's (Oct. 23-25, 2002) The Conservation Corps Newfoundland and Labrador celebrated its tenth anniversary with three days of webcasting and FM Radio 100.1. Montreal (11/12 Octobre, 2002) Telecommunities Canada, The Victoria Free-Net Association and Ryakuga partnered to provide video webcasting from the Global Community Networks Congress. We focused on the plenaries for The World Summit on the Information Society: What Role for International Civil Society. Stephenville (August 15, 16, 2002) - The webcast and community television broadcast of the first Sharing Our Future Community Media Gathering. Stephenville (July 13, 2002) Ryakuga webcast Blues Night - acoustic blues by Neil Bishop, Dennis Parker and Scott Goudie - from the Stephenville Theatre Festival. Burnt Islands (May 31, June 1, 2, 2002) Sharing our Future community media youth produce a community TV/FM Radio/Internet Simulcast. Kippens (March 17, 2002) Ryakuga and the College of the North Atlantic journalism students collaborated to webcast the first Gerry Formanger Musical Tribute. McKays (March 16, 2002) The Bay St. George and Area Development Association broadcast its annual meeting on Ryakuga FM 104.7. The event was also a Sharing Our Future webcast. McKays (March 7, 2002) Students tape and webcast a Sharing our Future community forum at the Three Rivers Lions Club. Halifax (February 2, 2002) Ryakuga webcast International Night at St. Mary's University. Buenos Aires (December 5, 2001) FM Dos de Mayo Cultural, Telecommunities Canada, The Victoria Free-Net Association and Ryakuga webcast a session from the Global Community Networks Congress. Stephenville (November 28, 29, 2001) The first broadcast of our new 30 watt portable FM Radio station. That simulcast was broadcast locally on Ryakuga 104.7 FM and on the internet as well. St. John's (April 26, 2001) Best Practices from the Rock was launched and webcast from the Conservation Corps Newfoundland and Labrador offices. St. John's (April 27, 2001) The Conservation Corps Newfoundland and Labrador facilitated the fourth Youth, the Environment and the Economy workshop. Youth webcast the event. Cap St-Georges (March 7, 2001) Sharing Our Future and ARCO produce the first Ryakuga webcast - a community forum on oil. Belair, St. Vincent and the Grenadines (August, 1997) During the Caribbean Federation of Youth work study camp, the National Youth Council of St. Vincent and the Grenadines and Ryakuga produced a week of community radio. Overland, St. Vincent and the Grenadines (August, 1995) The National Youth Council of St. Vincent and the Grenadines, the Caribbean Federation of Youth and Ryakuga produced the first youth, grassroots, participatory community radio special event in the Caribbean.